As well as a number of standard colour ranges Little Greene make two of their own, the Original Colours and the English Heritage Colours of England collections. Ask in store for colour cards, or sample pots can be purchased at Russell Paints. 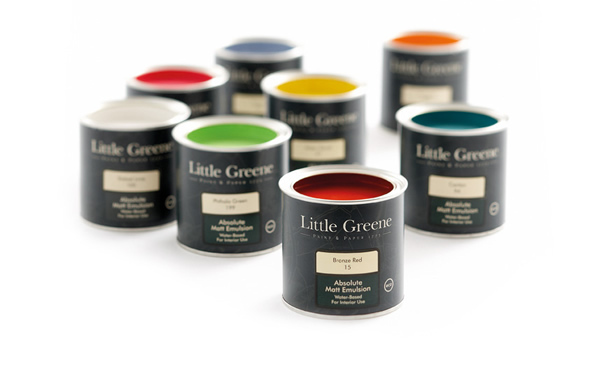 All of the paints from The Little Greene Paint Company Limited® are made to the highest quality standard en ISO 9002, suitable for both professional and DIY use. The paints are developed to have high opacity, be easy to use and very durable after application. A short description of these paints is given below. very high opacity paints with excellent resistance to damage through staining, cleaning, condensation and weathering. For direct use on interior or exterior walls and ceilings. High Opacity paints with excellent resistance to damage through staining and cleaning. For interior or exterior use on walls ceilings, wood and metalwork.